Read Ellen G. White Writings on a beautiful, easy-to-use, native Apple Mac OS application for: Macbook, Macbook Pro, Mac Pro, iMac, and Mac Mini computers. This the latest native 64 bit software for macOS that the White Estate has developed for EGW Writings. The White Estate has put a lot of time, energy and passion into developing this software for Mac users. This latest version supports Mojave Dark Mode. It also has added updates to Study Center, Syncing your study center with our new EGW Cloud. 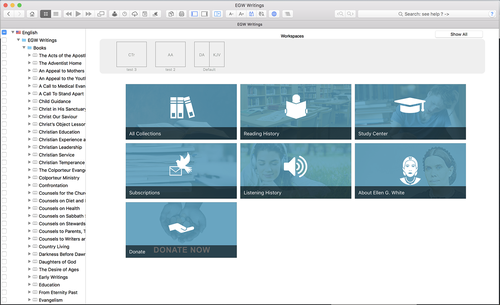 (Allows syncing your Study Center with iOS and Android devices running EGW Writings 2 v.5 if using same EGW Cloud accounts. We have also added saved workspaces just for macOS users. We pray you love all the new features!